Why? The reason why Apple sets this limitation is clear: control. They want to make sure that you only have songs that you purchased in their official store. What Are Limitations of iTunes? An iPod can be synced to only one iTunes library, or your iPod will be totally erased. Using the sync function of iTunes, it will cover the existing music on iPod. You will lose all your previous songs. If it is the first time you try to sync, it wil also erase music and other media files on iPod. It is not direct process. You need to put songs on iTunes library and use the sync feature to sync songs to iPod. It only supports specific music/video formats. You need to convert music first. So how can Catherine put music to iPod without iTunes from her brother's iTunes library? Let's continue and find it out. 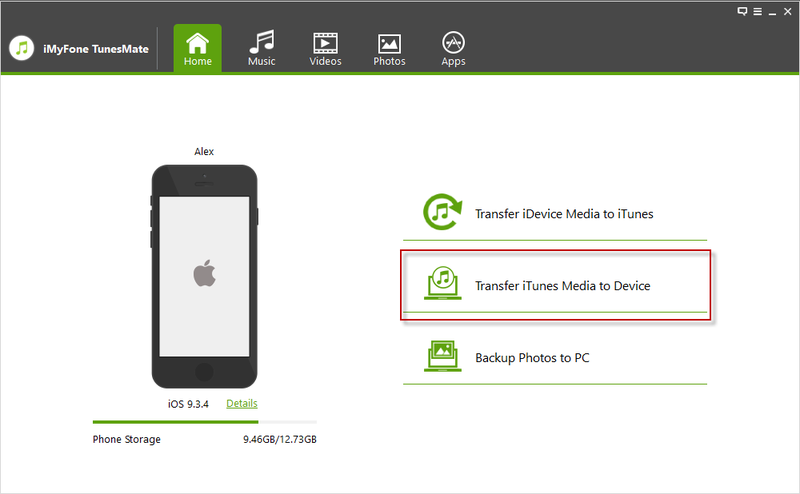 Instead of using iTunes, a better approach is to use iOS transfer tool like iMyFone TunesMate. It is an all-in-one solution that breaks the limits of iTunes sync. You can put music on iPod without iTunes from another iTunes library/computer even when your iPod is already synced. Existing music on iPod won't be covered when syncing iTunes media. All music formats are supported as non-supported music will be automatically converted. Put music on iPod from different computers, iTunes library, CDs and external hard drive without erasing. Share your purchased or free music among different iDevices even signed in different Apple IDs. In general, iMyFone TunesMate attempts to help you enjoy music at ease and share music with friends. Step 1: Open iMyFone TunesMate on computer. Plug in your iPod. Step 2: Click “Transfer iTunes Media to iDevice” at the home interface. It will show you the media files in iTunes library. You can check music and then hit "Transfer" button to start. This will allow you to send songs to iPod from another iTunes library without erasing your previous songs. Apart from iTunes library, it also allows you to put music from iPod from computer. Let's continue. Step 1: Download TunesMate and put it on your PC, then plug in your iPod. Step 2: Click on the “Music” tab, then you will be in the category of “Music”. 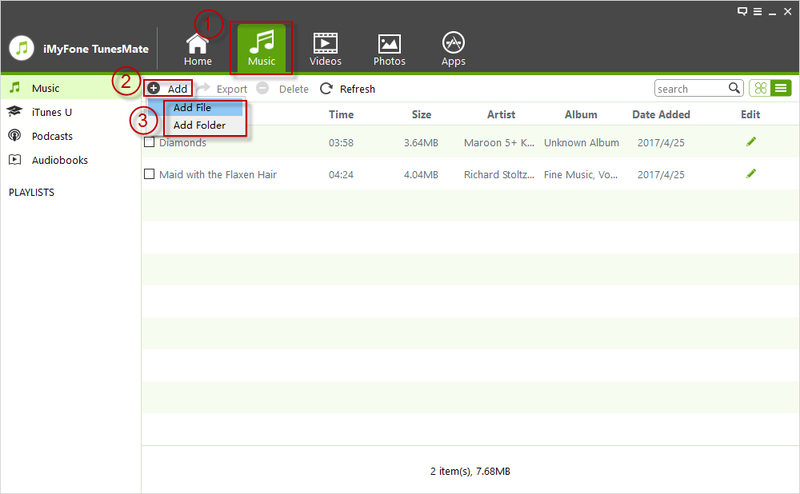 Step 3: Click on “Add > Add File/Folder” and go to where you locate the music on computer. Then, you can click “Open” and then add them to your iPod. If you try to put songs which are not supported by iPod, iMyFone TunesMate will automatically convert their formats to supported ones. That's why it supports to put all kinds of music. It can help you to restore your iTunes library from 1-5 iDevices, no matter when you buy a new computer, your computer crashed, iTunes library accidentally missing, etc. It helps you to merge your media files from different iDevices into iTunes library, so you can share your music with friends. You can back up your music, videos, photos, etc. to computer. You can transfer movies/add songs to iPhone from computer, iTunes library, external hard drive, CD, etc. Of course, you can delete unwanted media files on iPod in bulk. It is for free trial. You can smartly manage your playlists by creating new playlist, moving songs to playlist, or removing unwanted songs. So if freedom and convenience is a priority for you, iMyFone TunesMate is a perfect choice for you.